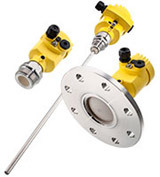 The ultrasonic sensors of the VEGASON series are suitable for non-contact level measurement of liquids and bulk solids in simple applications with stable measuring conditions. Typical applications with liquids are storage tanks and open basins. Bulk solids applications usually involve level measurement in open containers and small vessels. VEGASON sends short ultrasonic pulses in the direction of the measured medium. These pulses are reflected by the material surface and then received by the sensor. The instrument calculates the level from the running time of the sound wave and the entered tank height. The compact design allows for easy installation of the sensor. Since the properties of the medium do not affect the level measurement, setup and commissioning can be carried out without medium. The low-cost, non- contact measuring method allows wear and maintenance-free operation. The ultimate in pressure measurement from VEGA is the VEGABAR 80 series. These pressure trans- mitters measure gauge, absolute or differential pressure reliably – in all liquids, gases and slurry type media. To ensure high-precision measurement with these sensors, VEGA has integrated two of its own innovations: the metallic measuring cell METEC®, the world’s first metallic measuring cell with self-compensating temperature behaviour, and the ceramic-capacitive measuring cell CERTEC®, which has risen to become the top seller. More than a million VEGA CERTEC® cells are already in use around the world. Just recently, the ceramic-capac- itive measuring cell was upgraded with a tempera- ture sensor and a temperature shock compensation system, which ensures that the measuring results remain unaffected by rapid temperature changes. The yellow pressure sensors from the Black Forest also score a lot of points with other outstanding fea- tures: They have measuring ranges from 25 mbar to 1000 bar. They can be installed front-flush even in applications with abrasive media. They are ab- solutely gas tight thanks to their sealed process assembly. On top of all that, any sensor from the series can be easily integrated into an electronic dif- ferential pressure system.